Like tourists to the Grand Canyon, thousands of people routinely descend on Tucson, Arizona, in the first quarter of every year. The reason? Gemstones! An annual gathering of miners and cutters that is loosely dubbed the “Tucson Gem Shows” is the draw, with 40-plus individual fairs targeting largely professional buyers of rough and loose stones and some finished jewelry. While some venues permit entry to consumers, the bulk of the shows exist to serve the business-to-business audience. As a longtime member of the trade, the American Gem Society secures entry to the toniest destination in town—the American Gem Trade Association’s GemFair Tucson, held Jan. 31 to Feb. 5—to find out what AGS member artisans brought for your favorite stores to buy.To wit, here are three trends that you can shop by fall. To wit, here are three trends that you can shop by fall. Colored gemstone halo style engagement rings. You’re accustomed to seeing all-diamond halo-style rings in stores, but colored stone merchants are getting in on this style game with their own vivid versions. Think naturally color-changing alexandrite melee surrounding purple spinel at OMI Gems, or multiple hues of fancy color sapphires. These options are fresh in terms of look and can also help contain costs, depending on the gems. “Young couples are really interested in color for engagement rings—and not just blue!” observes Kambiz Sabouri, president of Gem 2000. 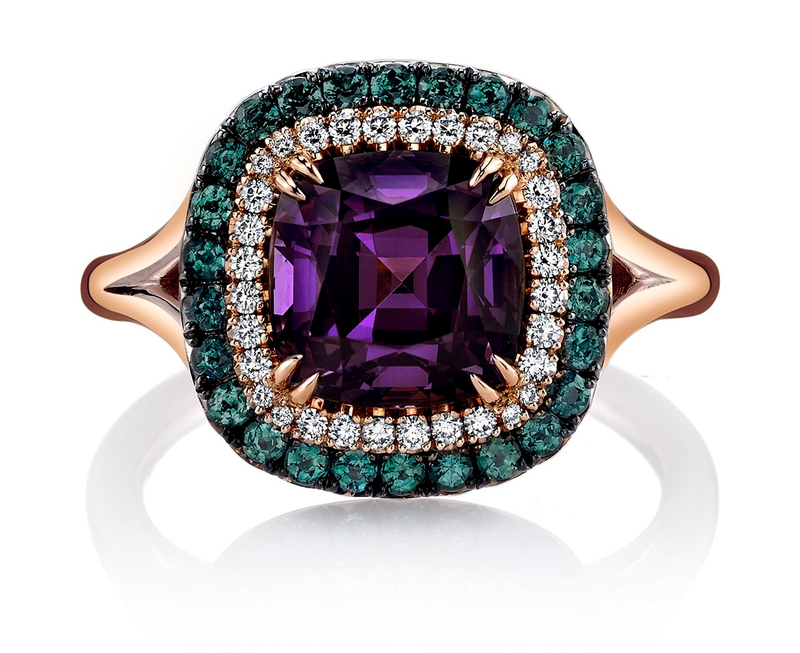 Ring with a purple spinel center stone and a halo of diamonds and alexandrite from OMI Gems. Unexpected color combinations. From rare pink Mahenge spinels with Mozambique ruby to opals with tsavorite or mandarin garnet, there are no rules for robust and beautifully colored gem pairings. In fact, Royal India isn’t creating anything that could be considered a basic look anymore; instead, it is making one-of-a-kinds. “People are tired of being ‘dull,’” remarks CEO Vishal Kotahwala. Helping to grow the numbers of sui generis? Rare stones like Paraiba tourmaline. “Paraiba with anything is wonderful,” notes Sabrina Bindra, director of sales and marketing for B & B Fine Gems. 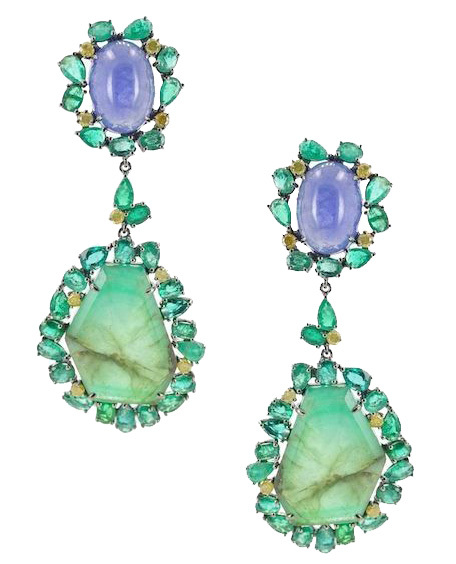 Earrings with mixed colors of gemstones from Royal India. Long necklaces for layering. Length remains a go-to for many fine jewelry-buying fashionistas. Versatility is one reason—heard of layering?—but so is a variety of materials. Long necklaces from pearl maker Mastoloni feature not just round or baroque shapes of South Sea pearls but also gemstone accents. And at Jye’s International, lightweight numbers, particularly 36-inch-long necklaces with rose-cut sapphires, are most in demand. “The younger generation loves to mix up their wardrobes with functional pieces,” says founder Jennifer Chang. 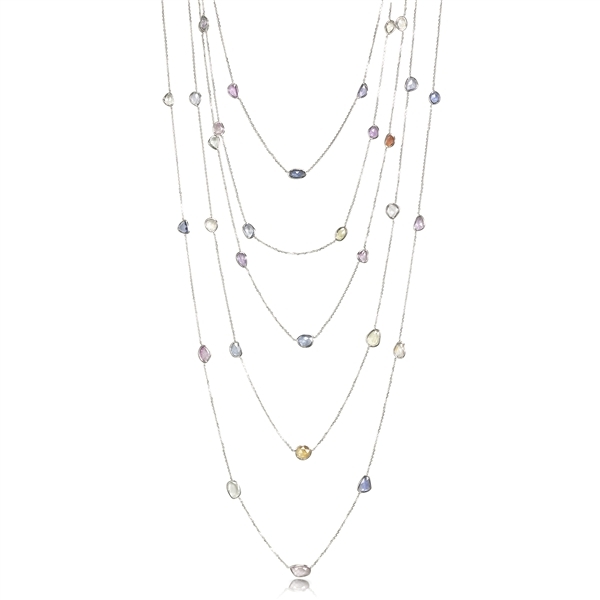 Multi-strand necklace with rose-cut multi-color sapphires from Jye’s International. Want to learn more about these gemstones and trends? Do you have your own designs in mind? Visit an AGS-certified jeweler near you and they’ll be happy to help you find the gems and look that’s right for you! Here’s their latest finding. 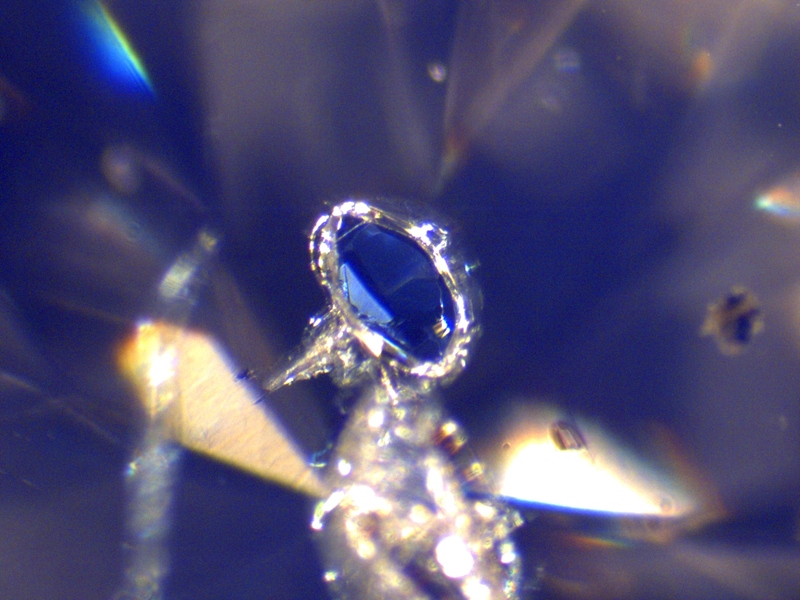 It’s a blue crystal in the table of a 2.23 ct diamond. It kind of looks like a sapphire ring embedded in the middle of the diamond. What do you think? Click on the images for a larger view. Crown view at 25x magnification. Crown view at 50x magnification. To learn more about diamond grading, clarity, and AGS Laboratories, click here. To find a jeweler who carries AGS Laboratories Diamond Grading Reports, click here. AGS Laboratories is a nonprofit diamond grading lab created with a mission of consumer protection. Ask your jeweler for an AGS Laboratories Diamond Grading Report. Accept no substitutes, and buy your diamond with confidence! The gemologists at AGS Laboratories came across some more clarity rarities to share. If you missed the first two installments of this series, be sure to read Out of the Vault: Clarity Rarities and Out of the Vault: More Clarity Rarities. This first fun finding was taken at 50x magnification of a crystal shaped like a turtle, and the “turtle’s” reflection. Can you see it? (Look closely, you’ll see the body, head, and arm). This next image was taken at 20x magnification and exhibits iridescence in a feather. Some of our gemologists see the head of a rainbow trout, with the opaque crystal representing the eye. What do you see? When it comes to diamond grading, there are five factors that affect how clarity is determined in a diamond, and how inclusions are considered: size, nature, number, location, and relief. Size: Generally, the larger the inclusion, the greater the impact on the clarity grade. If the inclusions are large enough, the can also impact the durability of the stone. Nature: Refers to the type of inclusion it is and its relative superficiality or depth. Number: For the most part, the greater the number of clarity characteristics, the lower the clarity grade. However, inclusions are not always judged on the number, but on how readily they are visible. Location: The position of the inclusion/blemish in the diamond. Relief: The distinctness of the inclusion in contrast to the host diamond. The greater the relief, the greater the effect on the overall clarity grade. To learn more about diamond grading, clarity, and AGS Laboratories, click here. To find a jeweler who carries AGS Laboratories Diamond Grading Reports, click here. AGS Laboratories is the only nonprofit diamond grading lab created with a mission of consumer protection. So…I’m back! It’s been a while since I have regaled you with my gem nerd knowledge, so today I need to do a quick recap. We started off discussing color, then we went into clarity, followed up by my tales from Antwerp, Belgium. This time, we need to discuss the absolute most important aspect of any diamond: how it is cut! Because this is so important, we need to split it into a few parts just so I can hold your attention and give you the most important details. My clarity blog ended by pointing out that the way a diamond sparkles generally has very little to do with its carat weight, its color, or its clarity. 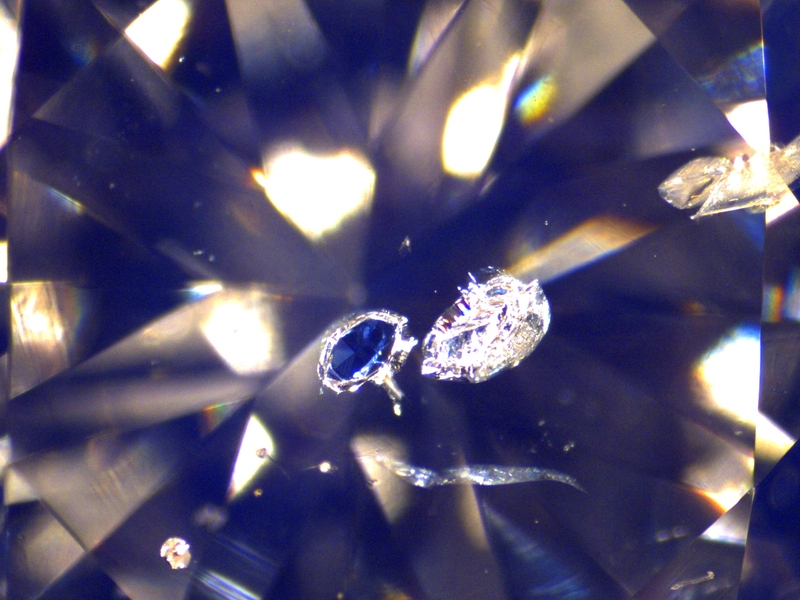 So what causes that dynamic little laser show you see in a perfectly cut diamond? I will do my best to explain. For just over a hundred years, cutters have known how to properly proportion a diamond to maximize its sparkle. Yet without modern technology, they were forced to use nothing but mathematics to accurately decipher what angles would ensure the maximum beauty of a diamond. Over the years, I’ve had thousands of interactions with clients at our diamond counter, and while everyone is looking for something a little different, the constants that every buyer wants are the same: they want their diamond to be as big and as sparkly as possible for as little money as possible. Simple enough, but most people go about this process the wrong way (initially, at least). So it’s my job to help them see things from the proper angles (diamond cutting pun intended). After some initial Internet research, the average diamond consumer becomes fixated on color and clarity and starts to focus most of their attention on those categories. This isn’t incorrect so much as it’s just incomplete, because it’s a little misguided to value those areas over the cut grade of the diamonds you are shopping. Color and Clarity are important. They have to be since they’re based on rarity and because they affect the price so much. But here’s the truth that almost no diamond seller will tell you… Ready for this bombshell? Here it is: once you put that diamond on your finger, absolutely nobody will ever walk up to you and say, “Wow! That’s a really pretty 1.01ct G color VS2 clarity diamond!” Ridiculous right? Know why? Because unless the color and clarity are terrible, nobody notices those (not even your jeweler). What you, your friends, your family, and everyone else does notice about a diamond is its size and how much it sparkles. And what I’m telling you is that color and clarity have almost no influence on how much a diamond sparkles (again, unless they are lousy). So that brings us to the cut grade and the proportions of a diamond which, from an educational perspective, have always been the most difficult to explain because, frankly, there are so many numbers to focus on that it can be hard to know which ones to single out. Some people try. They look at the table percentage or the depth percentage and assume if they are in line, then the rest must be as well. But this is not always the case. For generations, the diamond industry has known that the cut grade is the most important factor in describing a diamond’s beauty, but they struggled for decades to explain why. In fact, this is such a complicated topic that universally-accepted grading standards for Cut didn’t make it into the marketplace until nearly 40 years after the accepted nomenclature for color and clarity were instituted. It was in 2005 that the AGS Laboratories from American Gem Society (AGS) became the first diamond grading laboratory to bring clear standards to an otherwise fuzzy conversation. They accomplished this by basing their cut grading on both 3-dimensional modeling and on the actual appearance of the diamond. While other laboratories have since followed suit with systems of their own, I have always been a believer that the AGS system is the most thorough and reliable.